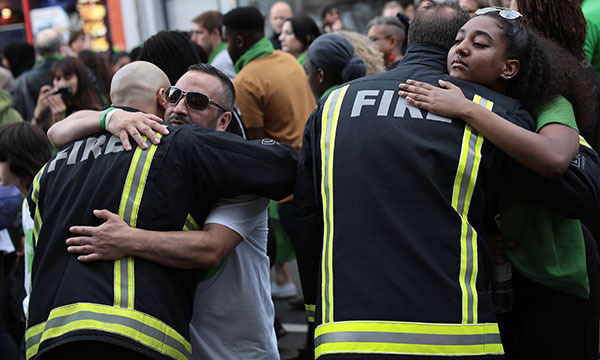 The recent first anniversary of the Grenfell Tower tragedy drove home to me the importance of emergency personnel supporting one another. The devastating imagery of the burning building will be etched on our minds forever, but what also concerns me is the inadequate support given to the emergency personnel to help them process the harrowing events. As fire crew, police, nurses and paramedics, we all have emotional needs that, if left unaddressed, can create future difficulties for ourselves and our families. Some services handle these events better than others, but a lot more could be done to strengthen support for emergency teams across the UK. Our reactions to these events can creep up on us until it becomes difficult to make sense of what we are feeling. We sometimes call this post-traumatic stress disorder. We need to remember that the incidents we attend, not our reactions to them, are abnormal. What we witness is the raw end of life that is frequently concealed in the darker corners of society, and these situations naturally test us. We need opportunities to untangle our thoughts and gain perspective on these events and our reactions to them. What we do on a day-to-day basis is hard to absorb so we need an integrated infrastructure to support us when emotional exhaustion leaves us at our lowest ebb. It is great, then, to see the work of Our Blue Light, an organisation that aims to improve the mental health, wellbeing and working lives of emergency and essential services professionals, including ambulance, fire, police and the NHS. Talking about how we feel can help us to re-invest in our future, and enable us to continue to offer an exceptional service to patients from some of the most highly skilled and respected emergency services in the world.